My spontaneous Romanian-Italian-American friend, married to a French-Camaroonian-American occasionally visits me, bearing gifts because she knows I’m on this crazy GAPS diet. She grew up with traditional Eastern European food, spent her formative cooking years in Italy, and has the frenzied pace of an American mother. “The Best Ever Zucchini” is one of many of her delicious recipes that such a diverse background allows her to cook up out of nowhere; raciti, chicken livers, and goat stew are others! I feel so Italian when I eat this dish. When I asked her how to make the zucchini, she said, “Oh. It’s nothing.” But, let me tell you, it’s something, and it’s great! On a recent visit to her house, with 9 kids running around, she showed me how to create this awesome zucchini. If you like Italian antipasti type stuff, you will LOVE this. If not, may not be your thing. It seems a bit complex for kids’ tastes, but it’s a real hit with my husband and I. Refrigerate a day or two for optimal flavor. Prepare dressing/marinade: Combine olive oil and vinegar in a container with a lid you can mix well or shake. Add 1-2 cloves pressed garlic. If you don’t have a garlic press, slice it or dice it as much as possible and add. Add a few turns from a sea salt grinder (or a couple pinches of your choice of salt). Shake well. Prepare zucchini: Slice zucchini thinly. Small, young zucchini really work the best. A mandolin is nice, but NOT a must. Cut either long ways or diagonal. Place on a hot grill with NO oil. 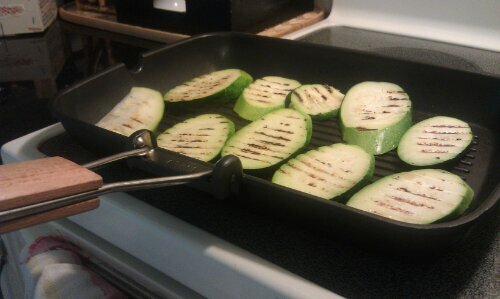 Place the zucchini on there “dry.” Grill until there are nice, golden lines on the zucchini on both sides. Place a layer of the grilled zucchini in a smaller sized casserole dish (perhaps 8×8 or smaller). Drizzle some of the dressing over it. 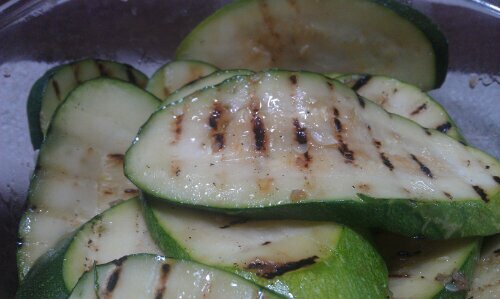 Grill more zucchini. Layer over the previous layer. Drizzle with more dressing. Repeat until all of zucchini is grilled and dressing all drizzled over it. Then mix gently. Place in fridge, covered, and allow to marinate. Keeps for several days. Alternatively, you may eat it warm and fresh when made, too. Family “gustar” report: It is not kid-approved at my house but my husband and I devour this stuff! If your child likes marinated things, like olives and artichokes, this recipe will probably go over great, even with kids. This entry was posted in GAPS, Paleo, Recipes, SCD and tagged antipasti, best zucchini, GAPS, paleo, primal, recipe, SCD on August 31, 2013 by thehomeschoolingdoctor.